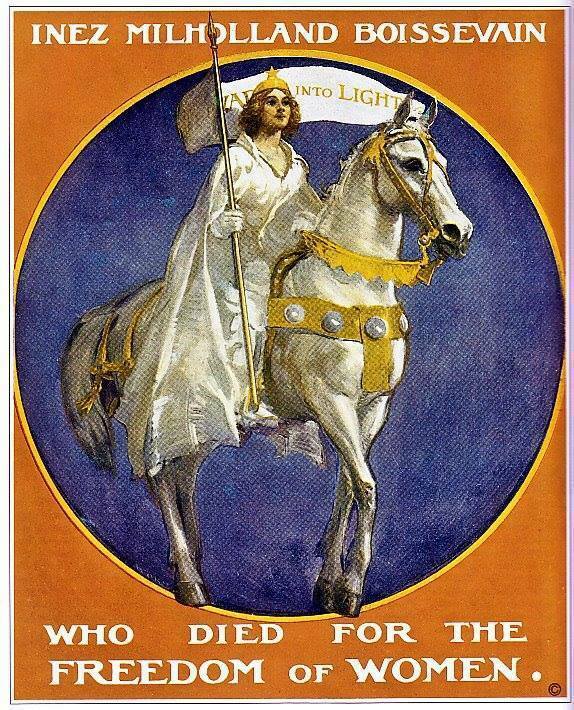 POSTER: Inez Milholland Boissevain depicted leading the landmark March 3, 1913 suffrage parade in Washington, D.C. on her white horse. December 25, 1916: A colorful and moving tribute to Inez Milholland Boissevain today at Statuary Hall in the U.S. Capitol. It was totally fitting that her memorial would be in such a place, having given her life for the cause of political equality for women. Despite health concerns that led doctors and family members to warn against a speaking tour, she kept a grueling pace for weeks throughout the Western suffrage States as Alice Paul’s “Congressional Union for Woman Suffrage” and “Woman’s Party of Western Voters” campaigned against Congressional Democrats, who control both House and Senate, for failing to use their power to pass the Susan B. Anthony (woman suffrage) Amendment. Then in late October, Boissevain collapsed on stage in Los Angeles, never recovered, and died on November 25th, still only 30 years old. Her final words to the audience, “Mr. President, how long must women wait for liberty?” will be on Congressional Union and Woman’s Party banners until suffrage is won. Despite today being Christmas, nearly 1,000 people came to pay tribute in the hall which was decorated with purple, white and gold banners. The ceremony began with a procession of women wearing purple, white and gold robes and holding tricolor banners, marching from the Congressional Library to the Capitol, passing through the Rotunda into the hall, then stationing themselves among the statues of American heroes. After the tributes were given, and in a move that Boissevain would have totally approved, a suffrage resolution was passed by those present calling upon President Wilson to “act so that by her death Inez Milholland Boissevain shall have delivered her countrywomen from the sacrifice of life.